We know that the Eyot’s hay provided a substantial part of the income of its owner, All Souls’ College, in the late Middle Ages; the Eyot’s lease as hay meadow continued until the end of the nineteenth century, but with the coming of the railways the value of hay as winter fuel for horses lost its significance. Plant life on the Eyot was to change, with its sale to Christ Church, and the digging of the Cherwell New Cut. What’s left of the meadow plants that flourished on the Eyot for the hundreds of years in which it was managed as hay meadow? We have recorded along the outer paths that border the water of the Thames, the Cherwell New Cut, and the Shire Lake Ditch. 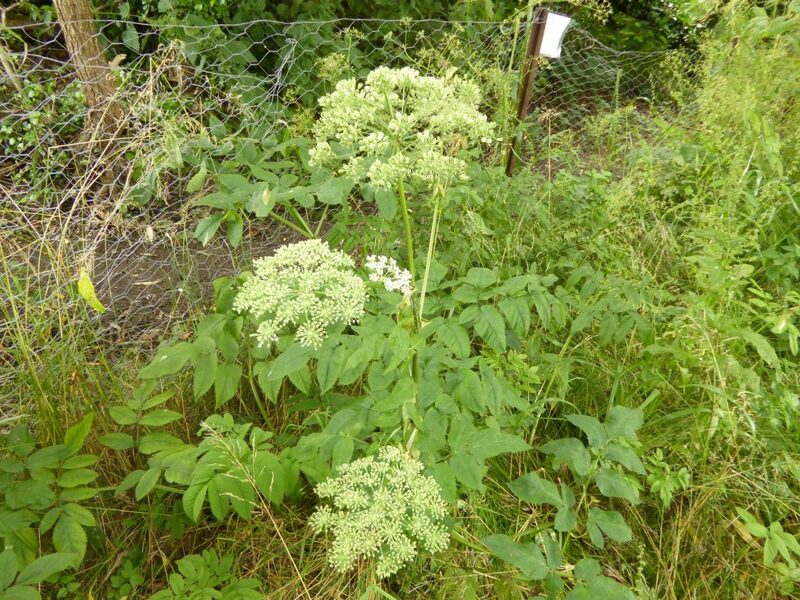 The discovery of Common Meadow-rue (Thalictrum flavum) on the Thames, in a patch that includes Common Valerian, Meadowsweet, Water Mint, Gipsywort, Yellow Iris, Wild Angelica, was one of the surprises of 2011. To protect this once common water meadow plant from inadvertent destruction by humans, and from browsing to destruction by muntjac, we made a small enclosure where it has flourished. It still needs some judicious nettle pulling and cutting back of overhanging trees. Another water meadow plant that has made single pop-up appearances and rapid disappearances along the bank on this stretch is the Fritillary (Fritillaria Meleagris). It flowers both downstream on the Thames and upstream near the Cherwell in some abundance. A water meadow plant that had flourished on the downstream end of this path, and that was under threat when the Friends began looking at the management of the paths, is Marsh Woundwort (Stachys palustris). The non-native invasive Himalayan Balsam (Impatiens glandulifera) was spreading extensively and threatening to take-over the river bank from the native water meadow plants. A programme of pulling the Himalayan Balsam began in 2010, and continued for the next five years fairly intensively. Now it rarely appears, though vigilance is always needed, as its seeds can float in from upstream. The Marsh Woundwort has its space back again. The list of plants recorded on this water edge path shows many other plants of rivers’ edges, some of which may well have been growing there since its time as the edge of a low-lying water meadow. 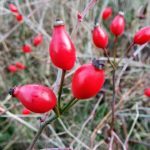 Find a plant list for the Water Edge Paths here. 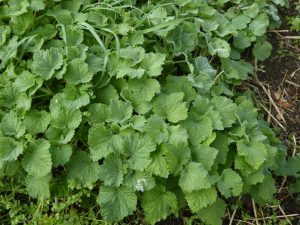 Garlic Mustard – likes sunny woodland edges. The area recorded in 2011 as the Wild Wood area included the area that had been dominated by Japanese Knotweed. 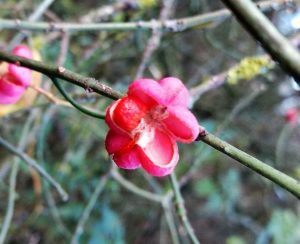 This had covered the site that is now open meadow so effectively that the huge Spindle tree, a magnificent old specimen whose trunk is worth inspecting for its curving shape, and whose flowers and berries provide subtle colouring if you look closely, had gone unrecorded in earlier surveys. 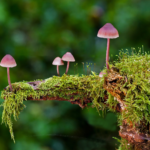 The strange names for plants in the Wild Wood recorded for 2011 that you may not recognise are the names of the mosses recorded by the County Bryologist who surveyed areas of woodland on the Eyot in 2011. 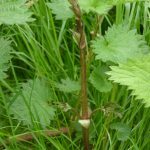 Variations from year to year of plants recorded in the wood may reflect different times of recording, rather than changes, though some plants such as the Barbarea vulgaris make apparently random pop up appearances. The seeds may have come from the boots of the campers who had formed a large encampment in the area in earlier years. As well as the beauty of the spring flowers of the Wild Cherries, planted at an earlier stage of the Eyot’s reclamation from its role as a rubbish dump, winter sunshine can bring a glorious gold light to the lichen growing on the old elders that stand back on the right behind the big mown bay, on the right as one walks down the main path. The elders here are unusually well grown and host both lichens and mosses, which in turn are habitat for insects for overwintering. These elders are gradually dying and their seedlings, if unprotected by fencing, are eaten in early spring by the browsing deer on the Eyot. The lovely clumps of snowdrops along the path through the wood to the Cherwell New Cut have been planted from clumps growing wild locally in Friends of Aston’s Eyot gardens. These apparently are not palatable to browsing deer and rabbits. The first former Japanese Knotweed site, the site referred to in the notes on the Wild Wood records, lies to the right of the main path not long before it turns the corner and runs parallel to the Thames. 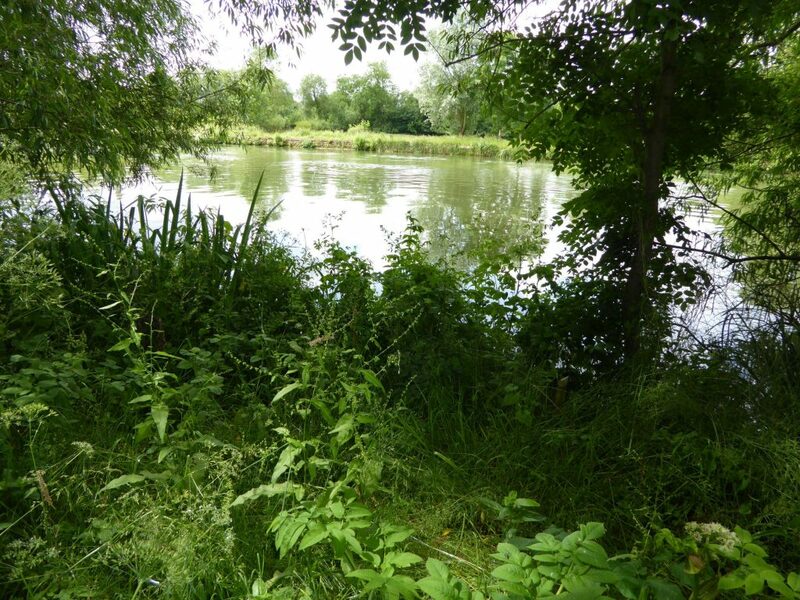 Newcomers to the Eyot may not realise that this had been totally dominated for many years by Japanese Knotweed, so tall that it had hidden the large Spindle tree described in the notes on the Wild Wood. Initially, once the clearance of the Japanese Knotweed had begun, the area was open to sunlight and comparatively bare of vegetation. 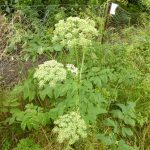 A few deeply rooted plants such as White Bryony, and spring vernals such as Lords and Ladies, had been able to compete with the Knotweed. 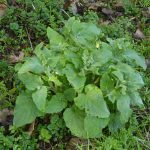 Other annuals that made a brief appearance while the ground was open to the sun but not yet thickly carpeted in vegetation may have been waiting in the seedbank, or seeds may have hitched a ride on small mammals or human boots. See the Fat Hen, Many-seeded Goosefoot, Guernsey Fleabane, Scarlet Pimpernel, Common Poppy, Dwarf Mallow, Fumitory for the annuals of arable land that took their chance here. 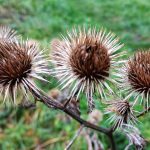 Once the Japanese Knotweed was in retreat, wild flower mixes were sown to provide meadow grasses and flowers as nectar sources for butterflies, bees and other insects. 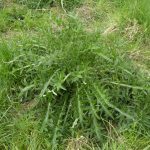 The Cornflower, Wild Carrot, Hedge Bedstraw, Field Scabious, Bird’s-foot Trefoil, Wild Marjoram, Cowslip, Yellow Rattle, Sorrel, Bladder Campion, Red Campion are among the wild flowers introduced here, and the grasses introduced include the rather fascinating Crested Dog’s Tail. This area continues to be managed each year as wild flower meadow, to retain and encourage a wide variety of meadow plants. 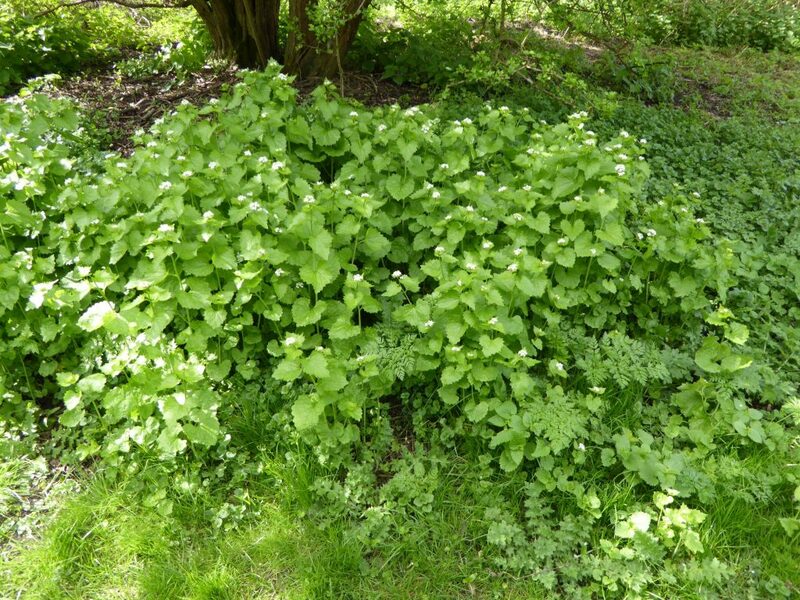 Find a plant list for the former Japanese Knotweed Patch in the Wild wood here. 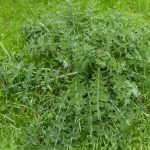 All three of our Eyot thistles have been found in this area. Here they are, April 2019, to help you to tell them apart at this point in the spring. 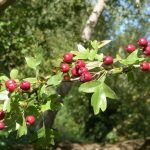 They all make good nectar sources for insects and seeds for birds in the autumn. 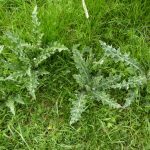 The Creeping Thistle comes up from its underground root system, but the Spear Thistle and the Welted Thistle have to build strong basal rosettes after seeding, so as to support their tall flower shoots later in the year. The Main Path runs from the bridge over the Shire Lake Ditch at the Jackdaw Lane entrance to the Eyot up to the bridge over the Shire Lake Ditch at the exit from the Eyot onto the Kidneys. The path was constructed as a wide metalled path to serve the lorries dumping rubbish on the Eyot in the first half of the twentieth century; the strengthened bridge at the end of Jackdaw Lane and the hard surface of the path till it turns left to run along the upper level of the Thames bank provide the owners of the land, Christ Church, with a route for emergency vehicles in case of threat to the boathouses on boathouse island, which is connected only by a footbridge to Christ Church Meadow. The electricity substation on the Eyot, opposite the boathouses, also needs vehicular access periodically. The advantage to the plant communities of this wide, well surfaced, comparatively dry path, is that the verges of this path are less trampled in winter by walkers than are the edges of the grass paths; the grass paths become wetter and muddier in winter and inevitably trampled into wider areas of compacted ground, making survival for meadow flowers and small wild flowers more difficult. 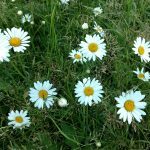 The arrangement with Oxford City Council to mow a wider area to each side of all the paths, with a vehicle that can remove and pile the cuttings away from the path edge, has meant that the threat to the smaller wild flowers and some of our traditional meadow flowers has been reduced. We have increased the area for them to flourish. Removing the cuttings is important. Previous mowing regimes had not involved removing the cuttings, leaving unsightly dying vegetation along the path edges. 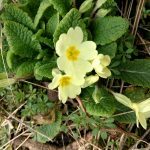 The rotting vegetation suppresses some of the smaller plants and enriches the soil to the benefit of the coarser grasses and nettles, which out compete the wild flowers. the former Japanese Knotweed area to the right of the Main Path, beyond the new meadow and the turn along the path into the Wild Wood. In 2020, the hope is to record intensively again to find out what changes have taken place. The time span should show which plants from the wild flower mixes have naturalized and how far they have spread. We hope to find out whether damage to plant communities from extensive trampling as more people come to enjoy the Eyot has been offset by creating wider paths and scalloped edges. Wild Flower Champions’ Patches 1, 5, 10 and 11 are along or close to stretches of the Main Path. Patch 1, on the left running from the shed to the Plantation Path, last year was found to have a White Comfrey plant, probably self-sown by boot or animal fur, from Patch 5, further down on the right. Patch 10, on the left of the stretch of Main Path just before Woodpecker Way comes in on the left, opposite the open area that overlooks the Thames, was solid with nettles before the Wild Flower Champion took it on. Patch 11 has been managed by hand pulling and by mowing, and is a larger area, bordered by brambles and wild rose. More details on the Wild flower Champions’ patches can be found here. The Middle Way runs left from the Main Path just beyond the new meadow in the direction of the Orchard. 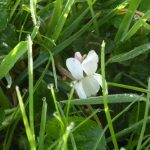 It has been grazed by rabbits in the past, and has a good community of grassland sward flowers, including Common Bird’s-foot-trefoil, which grows on Patch 7 of the Wild Flower Champions’ patches. Note in the summer that there’s a good number of Red Bartsia plants along the stretch from the Blackthorn thicket towards Patch 7, but don’t look for a red flower as it’s a small, dusky pinky-white flower. 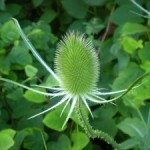 This is a good plant for encouraging other wild flowers as it is parasitic on the roots of coarser grasses. Red Bartsia occurs here naturally. The Yellow Rattle that serves the same purpose and is showier with its larger yellow flower has been introduced and appears to be spreading. At the far end of Middle Way, where it turns the corner round the brambles and at Orchard Fork becomes Woodpecker Way, there is an open grassy area on the left. This is the one area where Tufted Vetch has been found occurring naturally on the Eyot. It is more abundant on the Kidneys. This is really a hedgerow plant or plant of taller vegetation so the grass here is not mown. Look out for the toothbrush-like blue flowers in the later summer. Woodpecker Way is shaded by taller orchard trees and receives afternoon sun. Climbing plants with deep root stems thrive here. Look out in the spring for their shoots emerging and growing fast, climbing up through their hosts. The native Hedge Bindweed, the southern European naturalized Large Bindweed and the hybrids of the two species all occur along here. 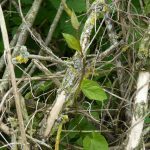 The hybrids are plentiful on the Eyot, unsurprisingly since Large Bindweed was recorded in 1946 in Jackdaw Lane, the first record in the wild in Oxfordshire, and the Hedge Bindweed is still plentiful along the Thames bank path of the Eyot. Other climbers to look out for are the Hop and White Bryony. It might help in picking out the White Bryony to know that it’s our native member of the Cucumber family. 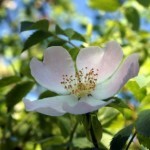 It produces creamy yellowy-white flowers in summer and strings of translucent green to yellow to red berries in autumn. Plantation Path used to run in a much straighter line, with the Plantation on its left, leaving the Main Path soon after entry from the Jackdaw Lane Gate and finishing above the Shire Lake Ditch where it meets the ditch path. One of the Wild Flower Champion patches, Patch 3, lies towards the beginning of the path. More details on the Wild flower Champions’ patches can be found here. The straight line of the path provided little variation in woodland edge habitat; all the trees, shrubs, grasses and flowers would receive the same amounts of light and sunshine, the same exposure to wind. The Friends of Aston’s Eyot have worked hard on projects along the path to provide a variety of light and shade and shelter and exposure to wind, and to manage the woodland edge with pruning of overgrown hedge plants, planting of new hedgerow area, and planting of clumps of trees outside the line of the original path. Some wild flower mix introductions have taken place along this path, especially in the scalloped end where some tree felling took place to create much greater diversity of habitat for plant communities. The species list for the path, being records made from 2011 to 2015, reflect these happenings. 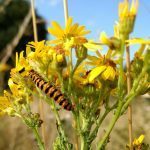 From 2013 onwards the first wild flower mix species, for instance the Wild Carrot, Common Knapweed, Common Bird’s-foot-trefoil, make their first appearances in the list. 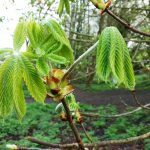 When recording resumes in 2020 it should be possible to see some of the effects on the plant community of the different management of the path. Some more puzzles from early spring leaves. 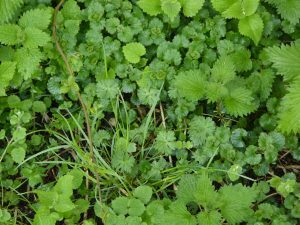 Main Path April 2019 Can you pick out the leaves of the White Dead Nettle, the Common (stinging) Nettle, the Ivy-leaved Speedwell, the Ground Ivy and the Cut-leaved Crane’s-bill, Main Path April 2019? 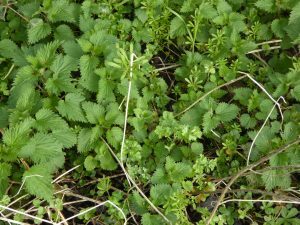 Most of the leaves are of Black Horehound, the early leaves rounder than dead nettle leaves, and a different, pungent smell if you brush them between your fingers. Purple late summer flower an excellent nectar source for insects. A tiny frond or two of Cow Parsley are in the picture too, and some Ivy-leaved Speedwell in flower at the bottom. 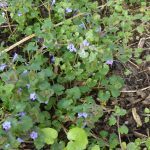 This is the early Speedwell to flower.